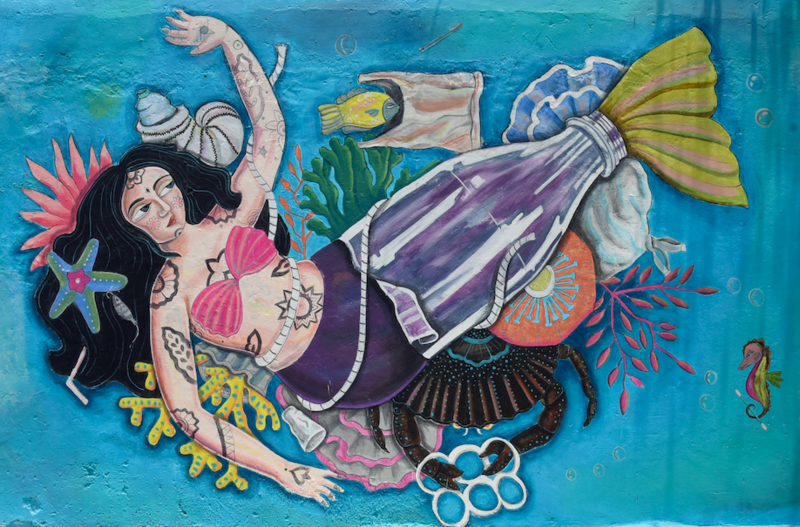 On this World Environment Day, Post-Art Project, an Arts Collective founded by two young Delhi artists, Gargi Chandola and Yaman Navlakha, is painting a mural on an SDMC Community Waste Collection Centre, opposite Nehru Place Metro Station. 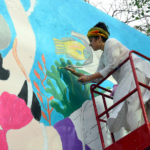 The mural will be unveiled on World Environment Day, on 5th June, which is this year being hosted by India. 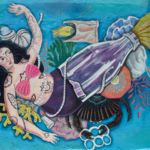 The theme for WED’18 is “Beat Plastic Pollution”, and concentrates especially on the growing plastic pollution in our oceans. According to the UN, each year, at least 8 million tonnes of plastic end up in the oceans, the equivalent of a full garbage truck every minute. To make it relatable, in the time it takes Hardik Pandya to bowl an over in a cricket match, four garbage trucks worth of plastic get dumped into the ocean. “We see the effects of plastic pollution every day in our towns and cities and even our rivers, but we hardly ever consider the effect it’s having on our oceans. Only recently because of photographic evidence are we realising the magnitude of the problem. This mural represents our concern and hopefully the audience will stop and consider it, even for a minute” says visual artist Gargi Chandola. ” This is a community event. And we chose to do it on the wall of a CWCC because it’s the first step to making a choice about what we consume and how we dispose of it”. “We approached the SDMC (Central Zone) with this idea to do it as a no-charge voluntary project, for WED’18 and they loved it” adds Yaman Navlakha, a photographer and other half of Post-Art Project. “The entire project has been crowdfunded. We received unbelievable support, and thanks to their generous contributions we have covered our material costs. Their work will be on display “till somebody paints over it” on the CWCC opposite Nehru Place Metro Station, 5th June onwards. Post-Art Project is an Arts & Media company founded by visual artist Gargi Chandola and photographer Yaman Navlakha. Their aim is to reimagine the stereotypes and conventions that define contemporary art. PAP has been commissioned on several public art projects, most notably an ongoing GoI project in Varanasi. Gargi Chandola is a self taught visual artist. She left her job as a communication designer in 2016 to get back to her passion of painting. To pursue that she took time off to be part of an artist’s residency in Gunehr, Himachal Pradesh. Her project was to restore the village square by painting murals. Her experience inspired her to pursue ‘public art’, and she has since been a part of many such projects professionally. 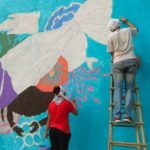 Currently she is leading her team of artists’ painting murals in the city of Varanasi, as part of an ongoing Heritage Augmentation Project sponsored by the Ministry of Urban Development. When not traveling, she works out of her studio in New Delhi. Yaman Navlakha is a photographer, documentary film-maker and musician. After graduating in Literature from the University of Delhi, he studied photography at Triveni Kala Sangam, receiving a Diploma in Film Photography in 2009and has since been practicing photography and documentary filmmaking professionally. He is also one half of GAYA Arts, an Arts & Media studio, currently under contract by INTACH to paint murals in Varanasi as part of an GoI project. A lifelong student of music, he has composed and recorded background scores for short films and documentaries. He lives in New Delhi.